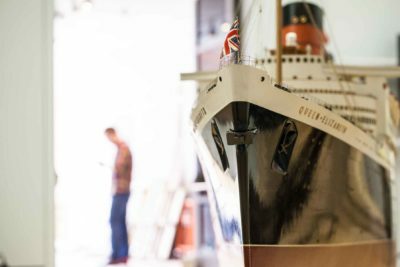 A model of the ocean liner Queen Elizabeth has sat serenely for the last 15 years, gliding along on its pedestal in a PEM gallery. 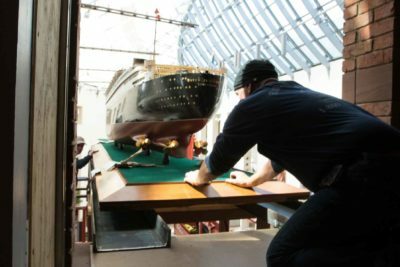 The 2,700 pound object experienced a dramatic disruption in early April as a crew made up of about two dozen PEM staff began the arduous process of moving her to an upper floor gallery to be part of the exhibition Ocean Liners: Speed, Glamour, and Style. 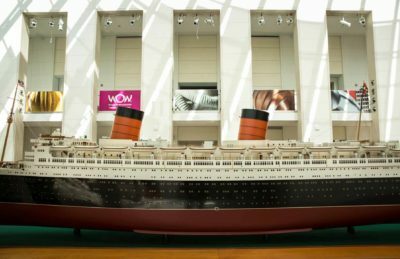 The model, billed as the largest model ever made of the largest liner at the time, came to PEM in 1970 and for many years was on view with PEM’s classic figureheads in East India Marine Hall. It even spent some years hidden behind walls in the Dodge gallery, since, at 22 feet, the stately length cannot fit into the freight elevator. Hand-carved from a piece of mahogany, the QE model was commissioned by Cunard to furnish their palatial offices on 5th Avenue in New York City. Moving the Queen Elizabeth. Photos by Bob Packert. 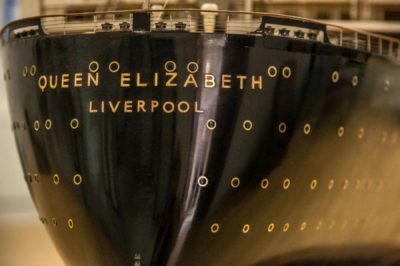 According to our records, “The intention…was to awe the viewers with the power and magnificence of the vessel and to entice them to book passage aboard” the actual Queen Elizabeth. Bassett-Lowke Ltd., Model of Queen Elizabeth, 1947–48, white mahogany, gunmetal, and brass. Gift of Cunard Line Ltd., 1970, M14220. Photos by Dinah Cardin. 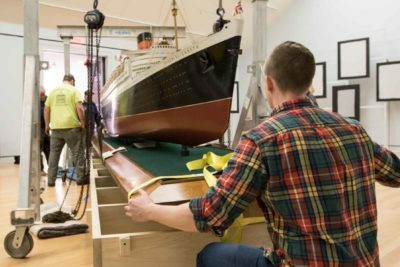 The last time the ship model set sail was the winter of 2003 when she was lifted by crane from East India Marine Hall, driven down Essex Street and installed in the first floor gallery known as the Nancy and George Putnam Gallery. That move also involved a huge team and a window removed from the gallery. Curatorial scholar George Schwartz (left) and Daniel Finamore, The Russell W. Knight Curator of Maritime Art and History (right). Photo by Kathy Tarantola. Examining the model of the Queen Elizabeth before it’s raised. Photo by Kathy Tarantola. 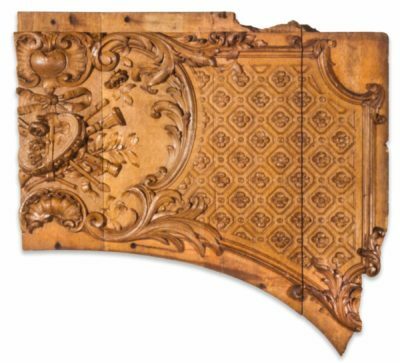 Featured in Ocean Liners: Panel fragment from the first-class lounge on Titanic, the area where the ship broke in half, about 1911. Wood. Maritime Museum of the Atlantic, Halifax, Nova Scotia, Canada: M2004.50.108. 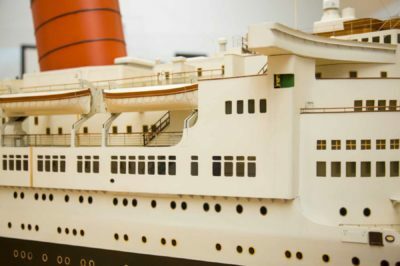 Commissioned by Cunard, the nearly 200 year old British-American cruise line, the model is an exact replica of not only a passenger ship that made hundreds of transatlantic crossings, but also of a period in time when elegant passenger ships full of champagne, movie stars and the hopeful dreams of its passengers sailed back and forth between England and America. The real QE set sail with society on board during the heyday of the ocean liner period when marriage partners and Hollywood contracts were sought at sea. It launched in 1938, used in the war before becoming a leisurely passenger ship and part of the fleet of floating worlds. Top artists, engineers and architects of their day participated in the creation of these icons of modernity. QE model scale. Photo by Kathy Tarantola. 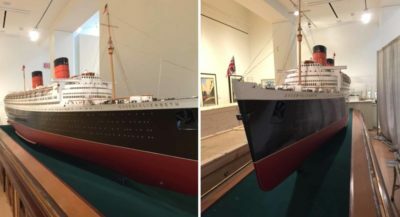 The model came to PEM with the help of the late Francis L. “Pen” Higginson, a former museum trustee, frequent transatlantic ocean liner traveler (who made more than 60 crossings) and collector of ocean liner and steamship ephemera. 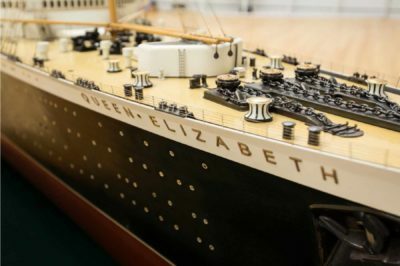 The Queen Elizabeth model is the apex of ocean liner models. Not just in scale, but attention to detail. Details of the QE. Photos by Bob Packert. 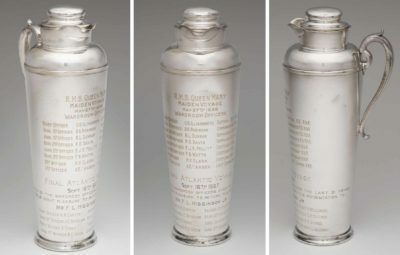 Gorham, cocktail shaker presented to the officers of Queen Mary, about 1936, silver. Gift of Frances L. Higginson, 1980, M18692. © 2016 Peabody Essex Museum. Photo by Walter Silver. 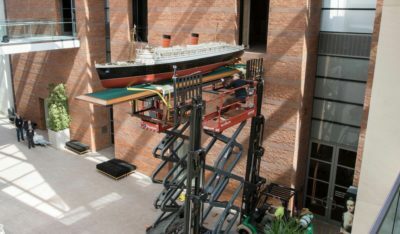 On a warm spring morning, the QE model, with its 900 handcrafted fittings, was carefully hoisted on equipment and slipped through a 53-inch wide window into the special exhibition gallery by a crew expert in their precision, much like the 12-man crew who spent thousands of hours carving the model. We realized ‘oh right,’ it isn’t going to fit on the elevator,” said Brittany Minton from the collections department. “It’s all creative problem solving. 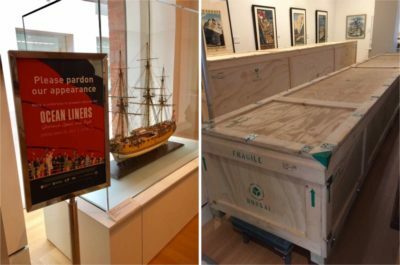 Just before the QE’s move, two other wooden crates containing ship models from the Mariners Museum in Virginia also glided through the Putnam Gallery to be hoisted into the small window. 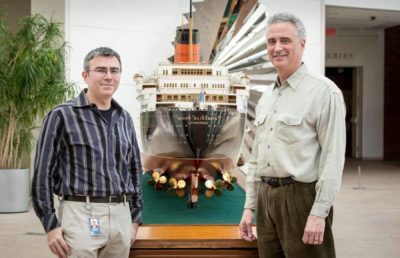 A 21-foot model of the SS United States will soon suspend from the ceiling, while a second massive model of the ship will hang on the wall. “Please pardon our appearance.” Photos by Dinah Cardin. 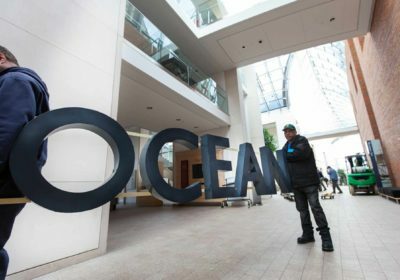 Two giant metal words, 24-inches high, OCEAN and TERMINAL, moved with their handlers through the Atrium, to greet museum goers from the Atrium’s bridge. These objects came from a private collector in Connecticut, where they hung on the outside of his house and are from the exterior of Ocean Terminal, Berth 102, in Southampton, UK, made about 1950.
Letters from the exterior of Ocean Terminal, Berth 102, Southampton, United Kingdom, about 1950, steel. Collection of Stephen S. Lash. Photo by Bob Packert. And, finally, the QE model, with its delicate handrails, lifeboats and tiny waving British and American flags was lifted way above our heads. Raising the QE. Photo by Bob Packert. The attention to detail is exact,” says Schwartz. 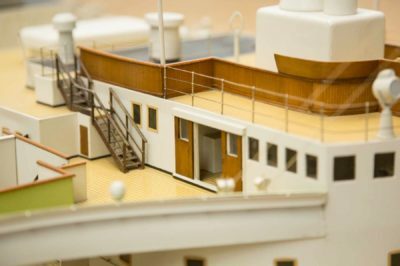 “It shows the artistry of ship model making at its best. Ocean Liners: Glamour, Speed and Style, an exhibition co-organized with the Victoria and Albert Museum in London, opens May 20 at PEM. Drawing from international institutions and private collections, the exhibition brings together nearly 200 works including paintings, sculpture, models, furniture, lighting, wall panels, textiles, fashion, photographs, posters and film. 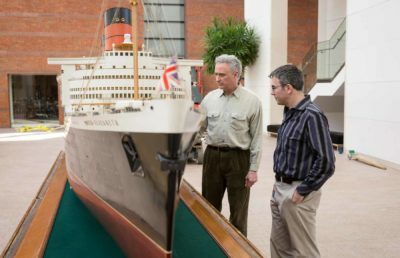 To read more about the QE and other ship models, see an essay by George Schwarz in our Ocean Liners catalog.